I’ve seen this meme floating around the blogosphere lately (created by The Broke and the Bookish), and I’ve decided to jump on it. Basically, as the name suggests, every Tuesday there will be a new Top Ten list, for which I will dutifully give you my answers. Lets go. Spring is springing. Kind of. This is England after all, and our weather is always a talking point. Regardless, in no particular order, here are ten books I’m intending to read before June 21st. I’ve been putting off this series for far too long. I think I’m simply intimidated by the six long (and getting progressively longer) books in this series. I have heard absolutely amazing things, so I think it’s time I put away my reservations and jump headfirst into the world of shadowhunters. I’ve been meaning to read this book for about a year, as I was intending to read it before its sequel, ‘The Mime Order’ was released earlier this year. Clearly that didn’t happen, but since there are no firm plans for a release date of the third book, I’m fully intent on getting up to speed with this series before then. I read ‘Anna’ last year, and thought it was surprisingly cute. Whilst I felt that I am slightly older than the target audience, it was still a sweet, quick contemporary read, so I’m hoping I have the same feelings about ‘Lola’. I’ve tried, and failed, to read ‘The Hobbit’ several times, but now the movies are all out, I’m going to try again (and I will succeed this time). I love the world this and ‘LOTR’ are set in, and the characters are absolutely brilliant, so I really don’t know why I’ve been unable to read it. That will change! I’ve heard so many wonderful things about this book. Not one person I’ve spoken to has had a bad word to say about it. I’m not sure I’m fully prepared for the emotional rollercoaster I keep hearing about, so I may have to wait until my exams are over to dive into this one. Having read ‘TFIOS’ and ‘Paper Towns’ at present, I have one foot in the camp that John Green is slightly overrated. I desperately want my opinion to change, so I’m going for attempt number three. I love, love, love this series. I’m almost done with ‘Eclipse’, and I can’t wait to read the conclusion to this series – I love the movies, so I’m sure I’ll love the final book just as much. So far I’ve really been questioning my decision to be Team Jacob (as I always was when I’d just watched the films). I have no idea why I’ve neglected to finish this trilogy. I really enjoyed both previous two books, even though I disliked the writing style. I want to be fully caught up (including having read the prequel) before ‘The Scorch Trials’ is released in cinemas. I have heard so many amazing things about this book, and Rainbow Rowell in general. I read ‘Fangirl’ last year, and while I enjoyed it, I was slightly disappointed due to the hype it had been receiving, but I have no doubt that I will enjoy this novel. The BookTube world has been going mad about this series in the last year or so, and having owned all four releases for a while, I figured it was about time to see what all the fuss is about. I love fairytale re-tellings – you really must read ‘The Bloody Chamber’ by Angela Carter if you do too – and I’m interested, if not hesitant, about the cyborg aspect. Have you read any of these ten books? Did you enjoy them, or have reservations? Please let me know in the comments! City of Bones and the Bone Season are some of my absolute favorites! I can’t wait for you to read them! Awesome! I’m excited. I wish there was an easier way to follow Blogspot blogs than via email. I’ve read Cinder, Elenor and Park, and City of Bones! All of them are great! I actually just started getting into contemporaries so I’ve been trying to fit more into my TBR but I still have so many fantasy books that I need to finish that it makes it hard sometimes. 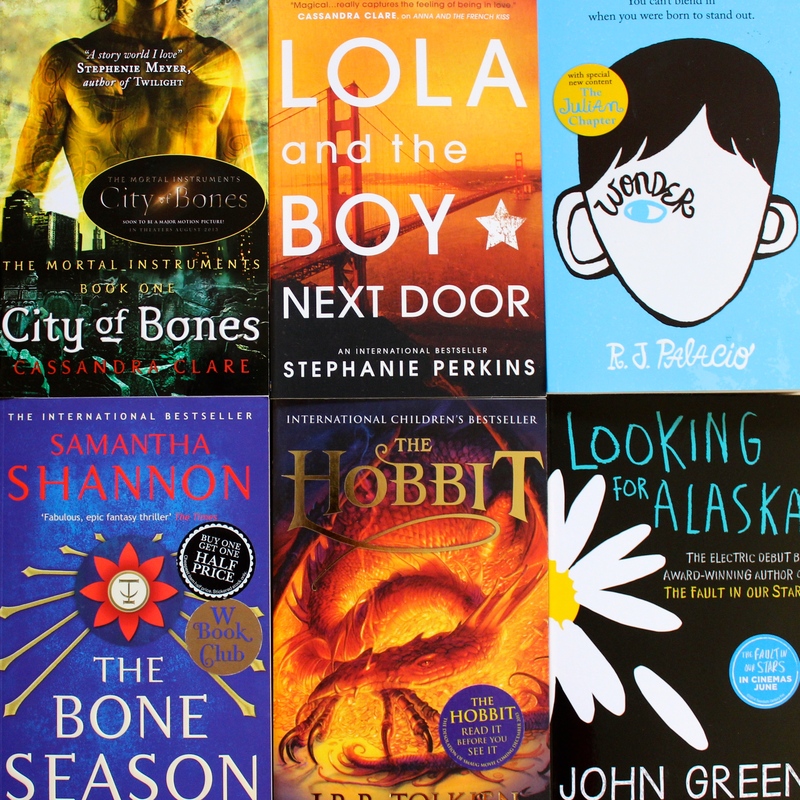 Eleanor and Park and Lola and the Boy Next Door are two of my favourite books. No doubt you’ll enjoy them. I’m like you with City of Bones, I’ve heard great things about it but just haven’t picked it up because I’ve also heard some really bad things. I finally got it from the library and should attempt to read it soon, fingers crossed! I’ve heard amazing things, so I’m looking forward to them 🙂 I don’t know why I’m hesitant with City of Bones really, I think I just keep finding books I want to read more. First world problems, hey?! I’ve really enjoyed the Lunar Chronicles so far, though I worry that the hype is so overwrought that expectations might be getting a little too high…I hope it doesn’t disappoint! Eleanor and Park and Looking for Alaska are both favorites for me and I am a big fan of The Mortal Instruments series too. It starts a little rough, but it’s got a fun ensemble cast of characters that are pretty great once you get to know them. I’m in the same boat! I think there are like four things on my goodreads currently reading shelf right now. Good luck to you! Looking for Alaska was my first John Green, I think I lucked out starting with that one. It was a breath of fresh air from what I had been reading. I hope you enjoy it.